HOUSTON – The astronauts on the space shuttle Endeavour woke up this evening to a song that was written specially for the crew who are flying the orbiter on its final mission. "More than 1.5 million votes were cast to determine the first and second place songs," NASA officials said. The second place winner, "Dreams You Give" by Brian Plunkett from Halfway, Mo., earned 612,959 votes, or 38.8 percent. Plunkett's song was played at 6:57 p.m. EDT (2257 GMT) tonight (May 30) to wake up Endeavour's six-astronaut crew. "We're looking forward to another busy day and hopefully getting home tomorrow," Endeavour's commander Mark Kelly said after being woken with the tune. "That song was the second place winner in the wakeup music contest. Congratulations to Brian Plunkett from Halfway, Mo." The first place winner, "Sunrise Number 1" by Jorge Otero and the band Stormy Mondays from Oviedo, Spain, will be played at 5:56 p.m. EDT (2156 GMT) on Tuesday (May 31), the day before the astronauts return to Earth. The winning song received 787,725 votes, or 49.8 percent of the total ballots cast. Public voting for the contest ran from March 29 through May 16. Kelly, pilot Greg Johnson and mission specialists Mike Fincke, Andrew Feustel, Greg Chamitoff and Roberto Vittori are on the last leg of their 16-day mission. The astronauts are scheduled to land at NASA's Kennedy Space Center in Florida at 2:35 a.m. EDT (0635 GMT) on Wednesday, June 1. Endeavour launched on its final flight to the International Space Station on May 16. 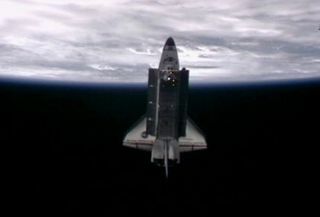 The orbiter delivered a $2 billion astrophysics experiment and extra supplies to the station to help posture the orbiting outpost for the years following the end of the shuttle program. Endeavour's crew conducted four spacewalks to upgrade the massive complex in space. After this flight, NASA will launch only one more space shuttle mission. The shuttle Atlantis will lift off July 8 to wrap up the 30-year space shuttle program.